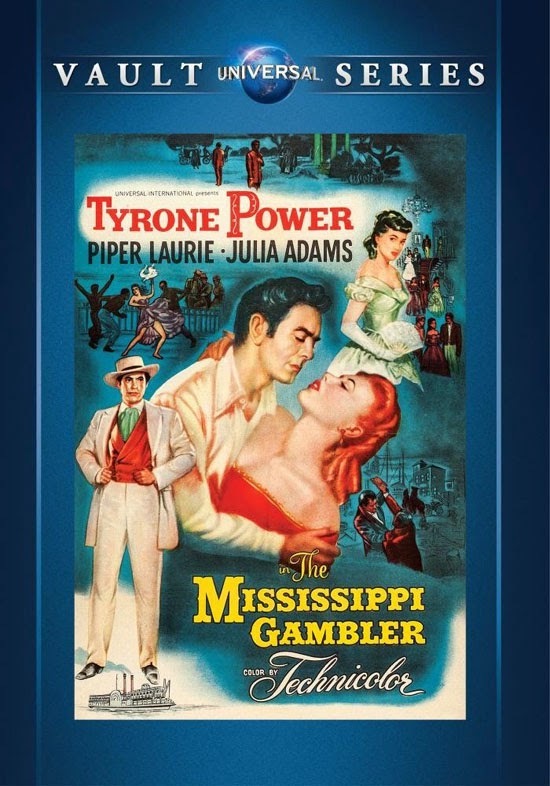 Tyrone Power stars as THE MISSISSIPPI GAMBLER (1953), just released on DVD in the Universal Vault Series, sold only at Amazon. This is a film I've been waiting to see for a long time, and it did not disappoint. It's a richly detailed movie with a great deal going on in terms of both story and character development. Best of all, front and center in most of the scenes is the man I consider the greatest movie star ever, Tyrone Power. Power plays Mark Fallon, who goes south after his father's death with the intent of earning a living as an honest riverboat gambler. He teams up with Kansas John Polly (the always-welcome John McIntire, who sometimes seems to have been in every Universal Western ever made); together the men earn enough to begin building their own gambling palace in New Orleans. Mark falls in love at first sight with Angelique Dureau (Piper Laurie); the chilly Angelique, however, resents Mark for various reasons. She's also threatened by Mark's passion for her, for reasons he figures out early on, and she decides to make the "safe" choice and marry her childhood friend, George (Ron Randell, LORNA DOONE). 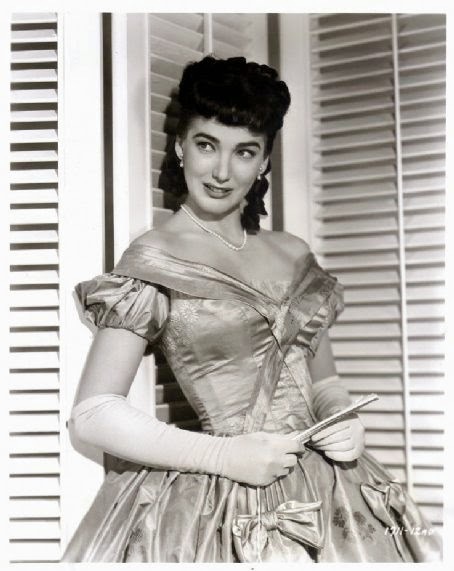 Meanwhile, lovely Ann Conant (Julie Adams, billed as Julia) has fallen in love with Mark, but he can't see her as anything more than a dear friend. The opening of the film, with the paddle wheeler and the dock, looked quite familiar, having just seen Universal's GAMBLER FROM NATCHEZ (1954) a few weeks ago. THE MISSISSIPPI GAMBLER is a colorful movie filled with riverboats, gambling, sword fights, duels, Southern mansions, and a collection of amazingly beautiful hats and gowns for Laurie and Adams, designed by Bill Thomas. More than that, the film has some really interesting emotional depth. In terms of the film's substance in portraying its characters, there's a rather remarkable extended scene where most of the cast watches a steamy voodoo dancer (Gwen Verdon); Mark realizes that Angelique is becoming noticeably hot and bothered and hopes the iceberg is melting at last. The entire sequence is wordless, but it was a real "wow" moment...not least as I wasn't expecting a Gwen Verdon dance in the middle of a Universal Western! It was a great example of how a musical number can be used to reveal character and propel the story forward. Angelique is so cold for most of the movie, I have to say I was rooting for Mark to see the light and finally fall for the warm-hearted Ann; at the same time, I admired that Mark never wavered from his hope that one day Angelique would come to him and admit her love, even if I couldn't quite see why he was so taken with her. Without giving the ending away, I'll just say the final sequence, beautifully scored by Frank Skinner, was deeply satisfying emotionally. It was a perfect ending, the kind that leaves the viewer sighing from sheer happiness. I'm an "always read the last page of the book first" kind of person, so next time around I think I'll enjoy THE MISSISSIPPI GAMBLER even more; I spent much of this viewing preoccupied with figuring out where the winding plot was going, with its many twists and turns -- plus I'm always a bit on edge wondering if the lovable sidekick will make it alive till the end credits! Sometimes they do and sometimes they don't (grin). There's a lot in the film to take in, and I suspect it won't be long before I watch it again. 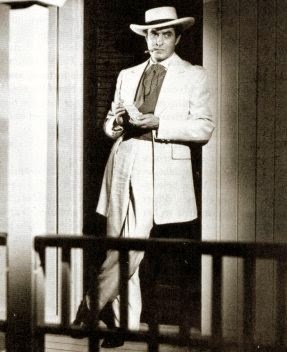 In her memoir THE LUCKY SOUTHERN STAR, Julie Adams wrote of Tyrone Power: "When he came onto a soundstage and smiled, it was as though all the floodlights had been turned on...I never saw him be anything but gracious and kind to everyone he worked with...the charm and graciousness that he had shown me was just part of his character...He left a lasting impression on the movie business, not only for the many great films he acted in, but also for the kind of person that he was." Adams' comments very much echo what another Power costar, Coleen Gray, said to me in an interview about 18 months ago. 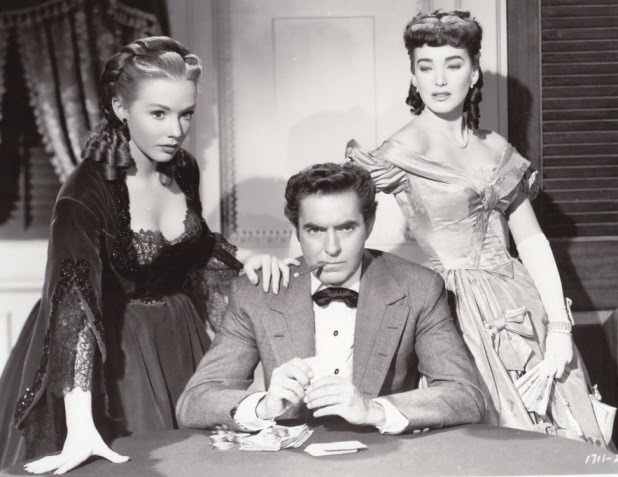 Piper Laurie wrote of her screen test: "When I found myself face to face with Tyrone Power, eighteen years my senior and still gorgeous, I thought I would faint." Power's character is quite interesting in that he's a man of honor and integrity, yet he seems to attract trouble...a number of people with whom he comes in contact are ruined or die. Mark even says to Angelique that perhaps she had somehow foreseen that about him. Laurie does quite a good job playing a troubled young woman, just as she did in the recently seen DAWN AT SOCORRO (1954). Laurie looked rather different in this film than she did in SOCORRO, though I haven't quite put my finger on the difference. In her book Julie Adams also wrote of her admiration for director Rudolph Mate, attributing his elegant staging in part to his past experience as a cinematographer. The film was shot in Technicolor by Irving Glassberg. The story and screenplay for this 98-minute film were by Seton I. Miller, who had worked on great films such as THE ADVENTURES OF ROBIN HOOD (1938) and HERE COMES MR. JORDAN (1941). The supporting cast includes fencing experts Fred and Albert Cavens, plus Paul Cavanagh, Dennis Weaver, John Baer, William Reynolds, Hugh Beaumont, Guy Williams, and, in a bit part in the wedding scene, Anita Ekberg. Given how really superb some of the Universal Vault DVDs have looked, it must be said this print does not rank with the finest in that series, though for the most part it's fine. In the scene at the governor's ball there were a few random blue flashes; there are also bright green reel change markers. 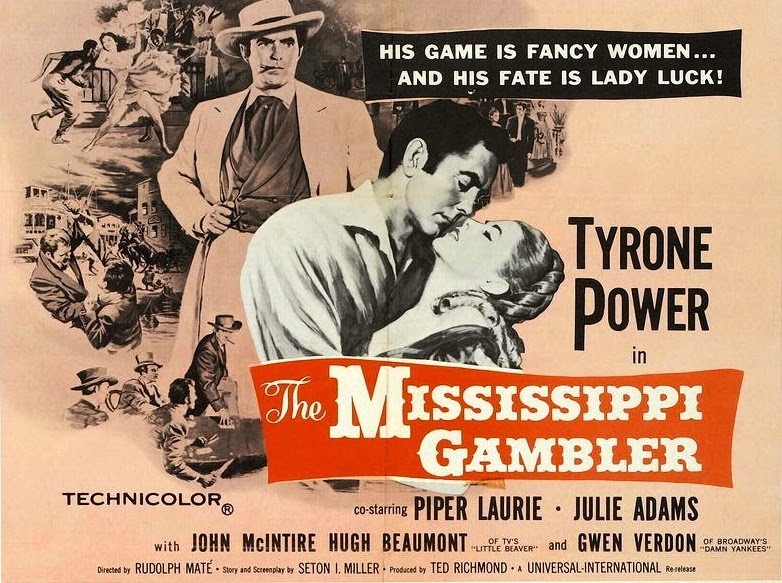 THE MISSISSIPPI GAMBLER is a slice of Technicolor heaven which is especially recommended for fans of Tyrone Power and '50s Universal Westerns. I definitely want to see this one! Sounds like one I will really like. Thanks for the rundown on a movie definitely on that old list of mine. The title certainly doesn't lead to great expectations, but you make it sound right up my alley. Sounds great. Can't wait to see it. This is a Tyrone Power movie I have not seen. Really looking forward to a chance to see it. One of the great screen actors, and so gorgeous! You evoked it so well, Laura. I especially liked what you said about the ending and was glad you singled out Frank Skinner for praise--I do think this wonderfully romantic score was one of his very best ever and that's saying a lot. While one can never know for certain if someone will like a movie, I would have bet plenty that you would love this one. Given Tyrone Power and an ideal role for him, that would almost be enough reason by itself but it has so much going for it in every way as you detailed well. That goes for its visual look and ambiance as well as rich story and characters. In addition to Mate and Glassberg, and Bill Thomas too, I think the art directors Golitzen and Riedel and set decorators Gausman and Heron rate a lot of credit. This is one beautiful Technicolor movie, the kind I'd show someone to convey why classic film lovers treasure certain things in the movies they love. It's kind of a dreamscape yet with a palpable impression of vibrant reality. I can't say there is any one movie that gave Universal in its 1950s Universal-International kind of a special place for me--it was a lot of movies through the decade as they came along. But this one may have been first and was certainly key. In any event, my copy came on my birthday but I was away, so now am looking for the best time to enjoy it again because it's been years. I think you understand the principle of delayed pleasure based on things you've written. It appears from comments that many (maybe most) of your regular readers don't know this movie yet, which is understandable because it has been so hard to see for so long until now. You've certainly encouraged everyone and I think we will agree they are in for a treat. Definitely get the "waiting for just the right moment" thing, I do it too!! I saw this one many years ago, and was quite disappointed by the ending. I had really wanted Mark to go with Ann, and forget the bratty Angelique. Now, partly due to your review, I've revisited it recently and liked it much better than before. I still have some mixed feelings about the ending, but Angelique really needed him more, I can see now. And Mark did display strength of character in his dealings with her. He let her know that he'd always love her, but didn't cater to her childish behaviour either. In short, he was her true-love. Hi Maricatrin, thank you for that lovely video link, I enjoyed revisiting the movie briefly thanks to the video! It has such a beautiful ending -- his expression! Very much enjoyed your thoughts on Angelique needing him more and Mark loving her but not catering to her behavior. I suppose that's one of the things that makes the ending so moving when the both finally meet each other on a level playing field, so to speak, each accepting the other.